Hanshew, Claud M., hired man, age 18, born in Indiana; parents born in Indiana; single; occupation: farm laborer, working out. Hanshew, Claud M, head-of-household, age 27, born in Indiana; parents born in Indiana; occupation: farm hand, own farm. Hanshew, Emma L, wife, age 21, born in Missouri; parents born in Missouri. Hanshew, Fred N, son, age 1 year 3 months, born in Missouri; father born in Indiana; mother born in Missouri. 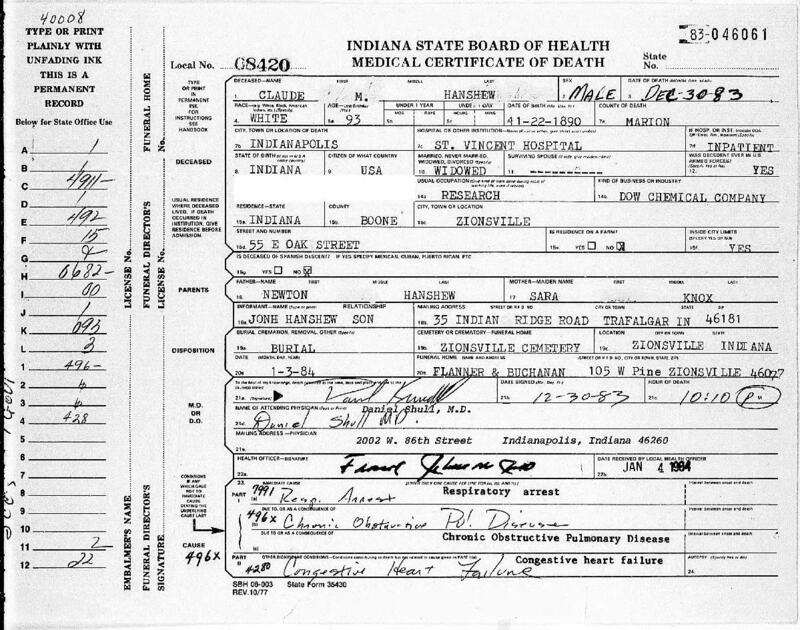 Hanshew, Claude, head-of-household, age 47, born in Indiana; completed 6th grade; on Apr 1 1935 was living in the same place/area; rented farm ($30/month rent); occupation: assembly, road grade co.; worked 52 weeks in 1939; $156 wages in 1939, plus other income. Hanshew, Emma, wife, age 41, born in Missouri; completed 2 years of high school; on Apr 1 1935 was living in the same place/area. Hanshew, Fred, son, age 21, born in Missouri; completed 4 years of high school; on Apr 1 1935 was living in the same place/area; occupation: clerk, grocery store; worked 52 weeks in 1939; $1384 wages in 1939. Hanshew, John, son, age 20, born in Indiana; completed 4 years of high school; on Apr 1 1935 was living in the same place/area; occupation: farm hand, farm. Ray, Charles, hand, age 23, born in Illinois; completed 7th grade; on Apr 1 1935 was living in Pana, Illinois; divorced; occupation: farm hand, farm. John Edward Hanshew birth record. 1900 census, Boone Township, Madison County, Indiana; roll T623-386, ED 88, page 3B, line #97, dwelling #57, family #57. 1910 census, Van Buren Township, Madison County, Indiana; roll T624-365, ED 127, page 2A, line #19, dwelling #26, family #26.